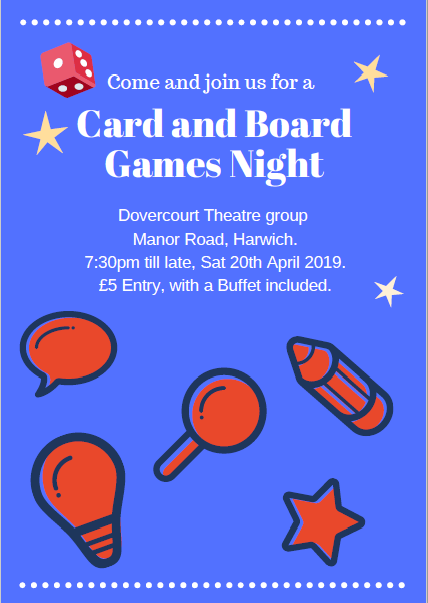 Our next social evening will be a Card and Board Games Evening on Saturday 20th April 2019. This is an exciting new venture for us, with a wide range of games to try, including: Pictionary, Cluedo, Cards Against Humanity, Balderdash, Codenames, Cranium, Articulate, Logo, Rummikub, Scattegories, and What Do You Meme? The idea is that rounds should be fairly quick, so you can take part in as many games as you like. All this, and a buffet, for just £5 per person! The venue is the Studio, as usual, and the action starts at 7:30pm. Contact Margaret on 07421 056814 to book your place.